ASKE believes that life/soft skills are integral parts of every training design and incorporate such skills and knowledge to all interventions. ASKE team has experience in empowering different communities (youth, women and community at large) through carefully and strategically developed training and coaching programmes focusing on socio-economical, emotional (EQ) and spiritual (SQ) empowerment. The core of the empowerment is lighting the fire of change inside the individual which leads to personal transformation and eventually a larger group or a community (social transformation) to find out solutions for their problems by themselves. 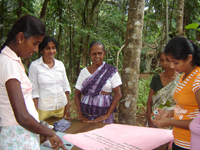 Community empowerment training or programmes are designed and delivered based on level of understanding of participants and contextual requirements. 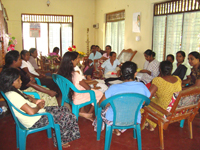 ASKE team has implemented a unique and exceptional process of low educated youth empowerment: THE COUNSELLING CYCLE APPROACH. The counselling cycle approach is to develop the social competencies and employability of the youth which contributes to the development of a socially responsible citizen. This is carried out step by step, the youth being gradually prepared and guided throughout, and offered interactions with people from different communities and social standings through a series of modules that address life skills in indirect manner, joint initiatives such as community development work, sports events, cultural activities, and youth camps (work camps and theatre camps). It harmonizes a set of life skills modules with occupational modules which include career counselling and guidance, group activities and exchange programmes to address social issues and peaceful coexistence, as well as individual counselling and psychosocial support. ASKE takes up the challenge of building the Knowledge, Skills and Attitude of community based organisations and public sector organisations, empowering the team in subject matter and process development to serve the community better and as a result achieve personal and organisational goals. Interventions in Community Based Organisations range from project cycle management, outcome monitoring up to evaluation; in public administrative organisations the range include: service orientation, conflict sensitivity, transparency and accountability. The main focus is to create an enabling environment that will cradle the objective of the people serving and being served. The ASKE team has its expertise gathered from experience of working with CBOs, Divisional and District Secretariats for over 6 years. 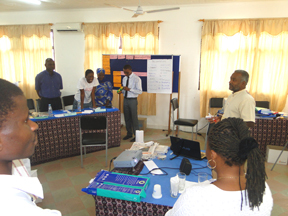 The core team of ASKE has been pioneers of ToT in training methodology in the Vocational Training Sector, since 1999. Bernard Baruch states that “the ability to express an idea is nearly as important as the idea itself”. ASKE takes up the challenge of building ’The Trainer’ that is capable of planning, delivering (presenting) and monitoring learning on any subject. Being a trainer can be a highly rewarding and satisfying occupation. As a trainer, you have the opportunity to help others improve their performance and become more successful in their careers. 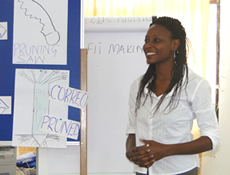 As a trainer, you have the opportunity to learn and grow in new areas of knowledge, skills and attitudes. At the same time, becoming a trainer implies that you have reached a level of maturity, confidence, and self-discipline that allows you to work in a professional environment. ‘Instructional supervision is a service to trainers, both as individuals and in groups. To put it simply, instructional supervision is a means of offering to trainers, specialised help in improving training. Instructional supervision is NOT evaluation!’ Where do excellent trainers come from? Are they born with the potential for excellence? Is the excellence developed over time and under certain conditions? In the early 1900's, the American education philosopher John Dewy emphasized that teacher learning and growth do not magically and instantly happen. Instead, they depend on appropriate interaction between the trainer and fellow colleagues. In the mind of John Dewy, we are all responsible for supervision. ASKE believes that everyone manages a project at some time. A student manages a project as part of class requirement, an instructor manages a field trip with students, and a construction engineer manages the construction of a new building. A development project manager, implements and managers a specific intervention over a period of time. All of these people apply the same principles ‘the principles of project management’. Over the past 50 years, the field of project management has grown from an art to a science. ASKE approaches the learning of project management by sharing and discussing practical assignments of the project management life cycle and writing of a project proposal, within the main parameters of time cost and quality. The team at AKSE has over 9 years’ experience and developed unique strategies to empower the beneficiaries and organisations in development projects. In the past 9 years, the core team of ASKE has rigorously tested almost all forms of evaluation techniques that are in practice in the world today. They are qualified and experienced practitioners to carry out needs assessments in almost any discipline, that sets the foundation to all developmental interventions’ and all the way up to outcome or impact assessments. Well versed in different evaluation methodologies, the ASKE team is able to identify the most suitable research methodology to a given intervention and locality and scientifically structured assessment surveys, Focus Group Discussions, and one-on-one interviews. ASKE conforms to OECD-DAC evaluation criteria and also covers good practices, systemic intervention and attribution to impact.